In a sense, I grew up listening to Bob Marley’s music. My mother was born and raised in Mandeville, Jamaica, and although I wouldn’t say she was necessarily a big fan — we probably listened to The Very Best of Andrew Lloyd Webber more than Legend — I definitely wore a One Love t-shirt in grade school and could probably sing along to No Woman, No Cry, even if I didn’t understand the lyrics. My grandmother was the main source of exposure, though. She managed a hotel in the Cayman Islands where my brother and I would spend part of every summer. To satisfy rum-drunk Brits and Americans, the hotel played Stir It Up, Is This Love and Jamming on a seemingly endless loop. It’s because of this over-exposure that I developed a cynicism about Bob Marley in my teens. I didn’t really pick up on the poetry of his lyrics — the songs just felt like touristy kitsch to me. A few years ago, though, I read a memoir written by his wife, Rita. Called No Woman, No Cry: My Life with Bob Marley, the book outlines the couple’s extremely humble beginnings in the slums of Kingston and how they rose out of poverty (more or less together, despite Bob’s numerous affairs). Most importantly, the book illuminated the depth of meaning in Marley’s lyrics, and made me re-listen to his songs. So I was extremely excited a few weeks ago when I read about an upcoming documentary on the singer. Directed by Kevin Macdonald, the film is a beautiful recollection of Bob Marley’s life, told by the people closest to him — Rita, his mom, his son Ziggy, his lover Cindy Breakspeare. It also adds a lot of texture to the music, detailing how the reggae sound evolved out of myriad influences, including ska, jazz and R&B. 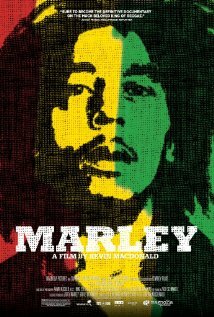 My favourite aspect of the movie is how it creates a portrait of Marley’s character. He was reserved, serious, introspective and a bit haunted. His childhood was harsh. He was abandoned by his father and ostracized for being mixed race — white and black. But he also had a unbelievably passionate spirit — especially for religion, soccer, women and, of course, music. Watching the film, you get a sense of the joy he found in his songs, and how they set him free, as though they were a curative for all the pain in his life. They’ve undoubtedly become a curative for others pain too. . I highly recommend the film for anyone either curious about or already in love with this great artist. This entry was posted in The Critic and tagged Bob Marley, Cayman Islands, Cindy Breakspeare, Cinema, Documentary, Film, Is This Love, Jamaica, Jamming, Kevin Macdonald, Marley, Music, No Cry, No Cry: My Life with Bob Marley, No Woman, One Love, Reggae, Rita Marley, Stir It Up by mmhague. Bookmark the permalink.